This week on My Favorite Pens we examine a pen I can truly call rare – the Red Hard Rubber Esterbrook! I don’t often use the word “rare” to describe a pen, but this pen probably deserves the title. After collecting Esterbrook pens for close to two decades, this pen showed up on my radar in an ebay search. You know the one, minimal description, blurry photos, pen isn’t even completely photographed in any one image, but you just know what it is, or at the very least, are willing to take a chance. I studied the images and description for a few days, examined other pens in my collection and placed a bid. The auction ended early in the evening on Christmas Day, and Lisa and I were coming back from taking the kids to see the new Hobbit movie in 3D. We had gone to a special theater to see the movie and on the way back this auction was about to end. We almost had to pull over to increase our bid, but decided to let it ride. We ended up winning the lot, which included several other pens and soon it was on its way to us. When it arrived it came with an unattractive accommodation clip which I promptly removed. I was pleasantly surprised to see the pen was in perfect condition. No cracks, everything original, and a perfect imprint. 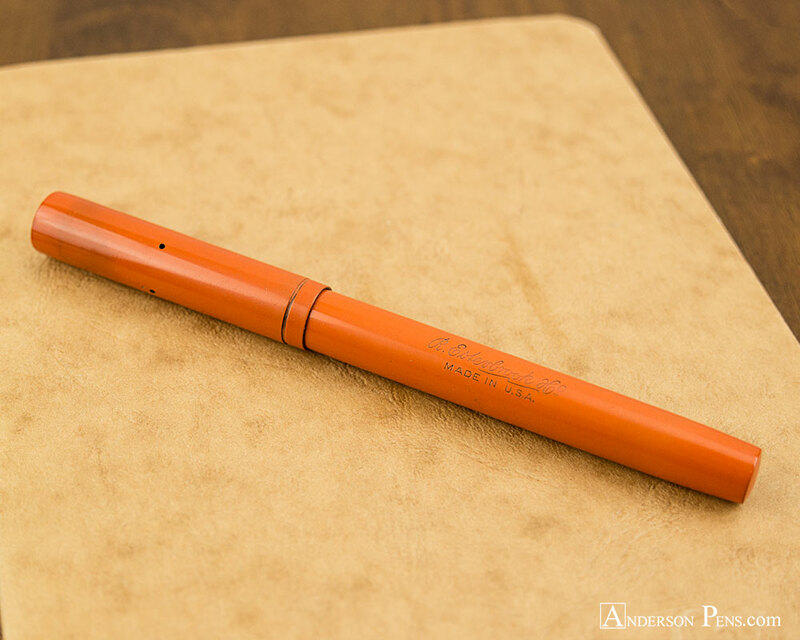 What makes this pen special, among other things, is this pen was made for Esterbrook by Aikin Lambert. It is well known Esterbrook experimented with having other manufacturers make pens for them in the 1920’s-1930’s. These manufacturers included Aikin Lambert, Paul Wirt, Conway Stewart and Onoto. Being I also collect Aikin Lambert pens, this is a perfect combination of two collecting foci. 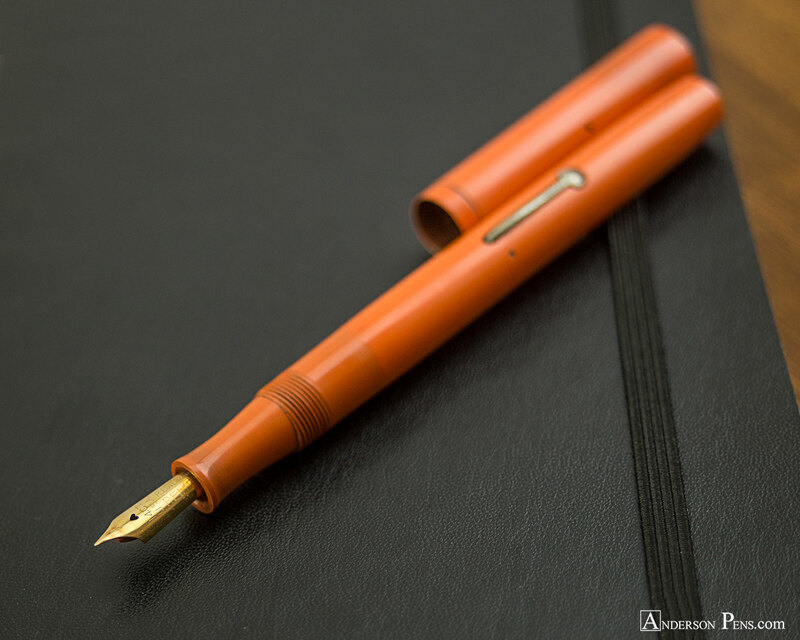 The fact this is made of red hard rubber (a difficult material to find for pens) makes it one of the most outstanding Esterbrook pens I have ever seen. Like many red hard rubber pens the whole pen is in the same material. Some RHR pens have black hard rubber sections and feeds, an economy of scale I suppose, since they already had those for other black pens. This one has a matching RHR section and feed. Aikin Lambert used a very thin feed design in their early pens. The pen is clipless, something I find to be quite elegant in vintage hard rubber pens, and most often found on eyedropper pens. This is a lever filler, and I carefully restored the pen to working condition, including polishing the red hard rubber feed. The imprint is the earliest design which transferred over to their own pens, “R. 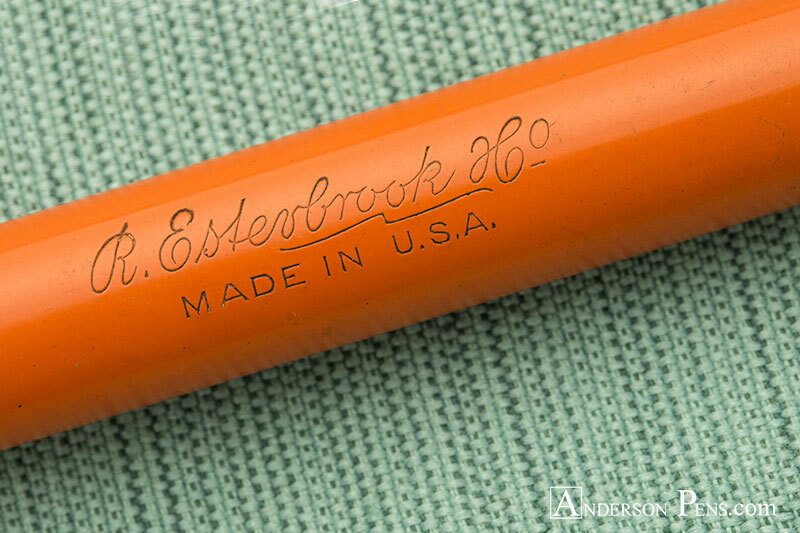 Esterbrook + Co.” and “Made in U.S.A” separated with a curved line in between. Unlike some of their other outsourced pens, this one does not show the “Relief 314” on the imprint, a call to the 314 Relief dip pen nib which inspired the 14kt gold nib present on this pen. Trying to pin down a date for this pen can be quite difficult, as few Aikin Lambert Catalogs exist, but one can generalize based on existing catalogs and features. The 1920 catalog is all hard rubber pens, but features an earlier style lever. The 1931 catalog featured both black chased hard rubber as well as some of the new colored plastics and utilized the same lever design we see on this pen. 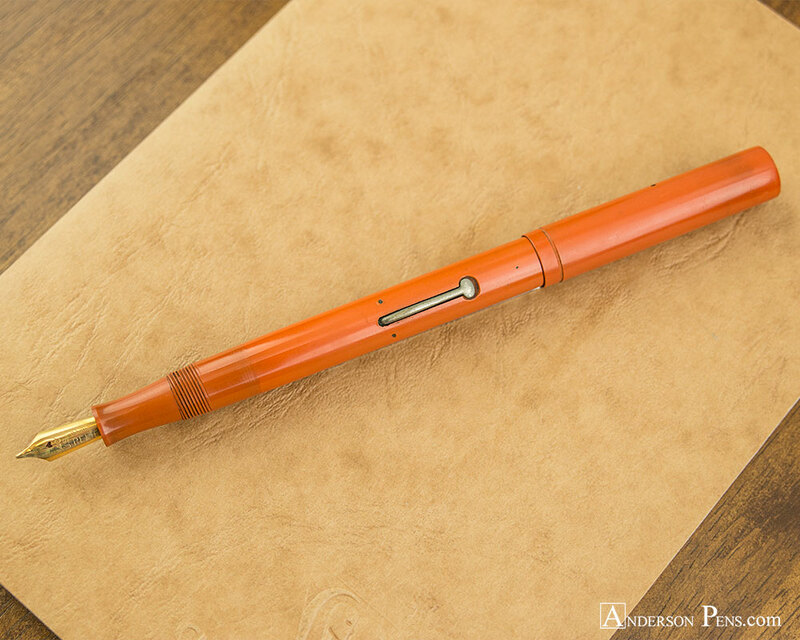 One would surmise this pen could be close to this 1931 frame as Aikin Lambert made Esterbrook colored plastic pens do exist (also very rare!). The lever is classic Aikin Lambert with an oval shaped end and a pivot at the extreme beginning of the lever. The pen also features an interesting nib, marked 14ct U.S.A. with R. Esterbrook Relief running lengthwise on the nib. What has always interested me is that while most of the rest of US manufacturers used 14k or 14kt for their gold markings, Esterbrook pens of this period with gold nibs all bear the 14ct mark. The nib is, as the “Relief” name implies, a right foot oblique. The combination of Red Hard Rubber, relative rarity of this pen, and the fact it encompasses two brands I love to collect make this Red Hard Rubber Esterbrook one of My Favorite Pens. This entry was posted in My Favorite Pens, Vintage Fountain Pens and tagged Aikin Lambert, Esterbrook. Bookmark the permalink.